If you haven't painted your home's wood siding in the last few years, then there is a good chance that your home's exterior might be in need of a little TLC this summer. 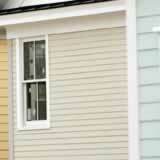 After all, siding that is made from real wood can fade, crack or rot, if left unprotected from the elements too long. So, if you want your home's siding to look its best and last a long time, then you'll want to paint your home's exterior about every three to five years. Protect the areas around your home from paint drips and splatters by covering any decks, steps or landscaping with plastic tarps. Using painter's masking tape to protect exterior lights, windows and doors can help you work faster and cleaner, because you won't have to stop painting every time a drip falls from your paint bucket or brush. Before painting, prepare your home's siding by scraping and sanding any loose or flaking paint. You can use a paint scraper to remove the old flaking paint, after which you should use a medium grit sandpaper to feather out the edges of the scraped area. Once the sanding is complete, use a garden hose or low-pressure power washer to clean the siding before you begin to paint. If your home's siding is cracked or damaged, then you should repair the area with some exterior wood putty. You can also use an exterior grade caulking to fill small holes, hairline cracks or obvious joints in the siding's surface. Choose the right type of paint for your specific project. Depending on which type of paint was previously used to cover your home's wood siding, you may get better results by selecting an acrylic based latex paint instead of an oil-based product. If you are unsure about what type of paint to use on your house, then consult a knowledgeable salesperson at your local paint shop. You can use a brush, roller or sprayer, when you paint your home's siding. Keep in mind that some projects might require all three tools. Angled bristle brushes are your best bet for the trim and detail work, while sprayers and rollers are ideal for painting large areas of siding. Whether you're painting cedar siding, shingles or pine clapboard siding, you are likely to get the best results when you thoroughly prep and wash the wood before applying the new paint. Remember, your wood siding must be completely dry before you begin painting, or you run the risk of the paint blistering, which means that you'll have to do it all over again next summer. Whenever you decide to DIY, do it like a pro.